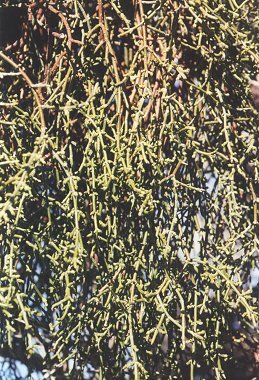 The Desert Mistletoe is a leafless plant with a dense cluster of jointed stems. They are partial parasites, which have chlorophyll & can undergo photosynthesis, but take water and nutrients from the host plant. The plant relies mainly on leguminous trees and shrubs such as paloverde, mesquite, ironwood and acacia. You can usually spot mistletoe as a dense, green cluster in the branches of these plants. Over time, it may kill the host plant by invading the bark and sap with its roots. There are over 1000 species of mistletoe in the world, almost all are partial parasites. Mistletoe is found in desert areas below 4000 feet in elevation from southern Nevada, California and Arizona to Mexico. The plant blooms in the spring, producing inconspicuous yellowish flowers followed by pink berries. Native Americans ate this fruit as do Silky Flycatchers, which rely on the berry as its main source of winter food. The seeds of the berries are extremely sticky, and the birds propagate the plant when they wipe their bills on another tree or when they excrete the seeds. Note: the white berries of a related species, the Big Leaf Mistletoe are bitter and poisonous. Don't go out and start eating wild plants unless you know for sure what you're putting in your mouth.